This image below from Run100s.com (which we think first appeared in the November, 1988 issue of UltraRunning magazine) is one of my favorites because it demonstrates the ruggedness of several well-known North American 100-mile events. Each race has its own unique profile, but they all share a common theme: challenging topography. Though each race has numerous ascents, success will ultimately come to the best downhillers. Let’s face it. Most ultrarunners accept the practice of hiking uphill, however walking the downs isn’t a common or recommended strategy. Downhill running is an eccentric-loading activity where the muscle is severely stressed during use due to the forces of deceleration (or braking) and impact absorption. Trashed quads lead to many ultra DNFs because the inevitable shuffling becomes too painful, frustration sets in, and cut-off times can’t be met. In order to minimize this damage, we have to harden our legs and low backs for all course-specific descents prior to race day. Strong ultra finishes hinge on our ability to move efficiently on all downhill slopes so that we make good time and, most importantly, enjoy our race experience. Ideal training grounds aren’t always easy to come by. The majority of the running population lives far from the mountains or weather conditions may inhibit access for much of the training cycle. How, then, do we prepare for big drops in elevation when adequate downhill running isn’t available? Here are three solutions, arranged according to preference, that mitigate this problem. 1) Specificity rules. This isn’t a new concept. We all know that training repeatedly on the very hills you’ll see on race day is the best way to prepare. If your race venue isn’t within reasonable distance of your home, try to go to any training camps offered or hold your own. The more time you spend on the course, the more prepared you’ll be for those descents and everything else come race day. Note: Added weight hastens quad damage. Wear all race-day equipment in training so your legs are used to the additional load. 2) Make mountains out of molehills. If traveling to the course in advance isn’t feasible, make use of your immediate surroundings. Explore your local parks and open spaces. Find trails that have the longest, steepest descents. If the downhill segments are short, do repeats. If those don’t exist, be creative. Venture off the beaten path to river and stream banks or to utility right-of-ways to discover slopes that might be just what you need. Ask other runners in your area where they do their hill training. No matter where you do it, every bit of downhill running logged before your event is advantageous. 3) Use what’s available. They aren’t ideal, but man-made structures and machines make reasonable substitutions for prepping the legs for tough descents because they provide positive gains in lower body endurance and power. Treadmills – Many modern treadmills decline three to six percent. Sustained, steady running at these slopes will toughen the quads. Bridges and parking garages – Because these structures aren’t very high, or continuous you’ll need to perform several repeats in order to create a beneficial training stimulus. Stadiums and buildings – Most workouts focus on running up steps, but running down stairs will eccentrically load the quads and build strength and control in the hips. Stadium steps are the best as they are wider and allow for a more natural running gait. If you run down flights of stairs in a building, use the elevator to return to the top to limit recovery time and accumulate more downhill time in succession. Biking – The use of a bicycle or stationary model builds aerobic capacity and increases quad strength. Bike uphill or at high resistances to maximize leg development. Add weight (hand weights or medicine ball) after you master the movement. You can do this solo (as shown) or have a partner hold your feet. Drills that emphasize speed and deceleration. Focus is on form, keeping the feet under the hips, and the knees aligned with the feet (not bowed in or out). The focus of this piece is on increasing our downhill proficiency, however, we cannot overlook the importance of uphill running. Charging up a slope is a concentric movement – a deliberate and controlled action utilizing the calves, glutes, hamstrings, and quads, which are all the posterior chain muscles we discussed above. You are essentially doing hundreds of one-legged squats as you ascend. Any short hill sprint or long ascent workout develops power and endurance, two necessary attributes when descending tricky slopes. There is a certain finesse needed for downhill running. We aren’t 10 years old anymore, but we can certainly learn something by watching kids at play. Stay calm. Don’t force your stride. Keep your core tight, but legs, glutes, shoulders, and arms relaxed. Work within the parameters of your own range of motion and let gravity do the bulk of the work. Remain perpendicular to your running surface. Lift your knees up and down, not forward and out. Use your arms as balance as the slope increases. Do not overstride. This will cause braking, slowing your progress, and place undo stress on the knees and back. Increase your cadence. Imagine taking light, quick steps. As the slope increases, you’ll need to maintain a forefoot landing. Have a friend take a video of you every once in a while so you’ll know what to change or improve. Sharpening downhill running skills takes patience and diligence. You’ve now got the tools to help you unlock your potential. Don’t settle for being a downhill survivor. Instead, institute these practices immediately and aggressively tackle the descents of your next ultra with the confidence of a downhill pro. Have downhills been your downfall? If so and after reading this article, what element(s) of downhill-ing technique and required strength are you lacking? Do you work on your downhill technique? 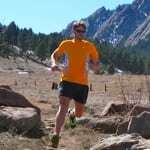 While Ian gives great advice on how to train your downhill running and strengthen the muscles required for it, do you have additional ideas that have previously worked for you? Great tips as always, Ian! I find a strong core makes a big difference – it gives strength and stability to the whole body which allows the upper to relax/provide balance whilst the legs work underneath._Also, concentration is hugely important – especially on technical terrain. I think I'm more 'in the zone' during long periods of downhill running than at any other time. It's a great place to be! Love it. All great stuff. Many middle/back pack runners I meet don't seem to grasp the importance of the downhills, as opposed to uphills. Anyone who has done a lot of data-driven heart rate monitor/pace training though has found this out. Let's say I have an 'easy' HR pace of 140. On an assumed uphill, if I push my HR from 140 to, say, 155, my pace changes from perhaps 10:00 to maybe 9:40. On a flat, changing from 140 to 155 moves my pace from about 8:10 to 7:15. And on a downhill… it might go from 7:30 to 6:15. Thus the same increase in effort 'makes up' way more time when you can get the speed multiplier of gravity. I will grant that HR is not the end all/be all of assessing effort, but it's a great first order indicator. Assuming your muscles are durable enough to take the downhill pushing, clearly on an effort basis if you're going to push yourself, the uphill is the worst place to do it, and the downhill the best. You get so much more bang for your buck, and your finish times will be shorter for the same given overall effort. In every single race I do, I get passed by a huge number of people on the uphills (and they're usually panting hard), and cruise by them on the downhills. Inevitably, we yo yo back and forth for the first third of the race, and then I never see them again as their 'kill it on the uphills' eventually destroys them. The venn diagram intersection of physics and physiology dictates that an even effort is better than doing intervals… but if you do want to push, the place to do it is primarily the downhills. All of this is predicated on the assumption that, as is the focus of the article, you are properly trained for those downhills! Where are you pulling these numbers from ? It makes no sense to me that the same HR change makes you 7% faster on a hill, but 13% fast on flats. Downhills are much more about technique, so I wouldn't look at HR that much. Of course it doesn't make sense to totally kill yourself on an uphill, but IMO generally speaking it pays off to push a little harder uphill than downhill. Another factor is weight. I'm on the heavier side (80kg/175lbs), so it makes sense that steep uphills do not suit me very well, and I catch more people on flats and downhills. @jomagam- I'll break my answer into two separate posts, as I think I was mixing two concepts together which confuses things (1. extra effort better spent on downhills 2. even effort better overall strategy). 1. Pulling these (notional) numbers from 4+ years of using a HR monitor on every single run and race, well over a year of only flat/treadmill running, and lots of analysis. So give or take, but that's the general trend for me. Assumption is NOT technical downhills so that you're not worrying about foot placements; I'm making an effort vs. slope argument here. Don't focus on the % faster, but on the absolute increase in pace. If you take my (notional) paces from above, given the same increase in effort, I go ~0:20 faster/mile on uphills, and 1:15 faster on downhills. Maybe it's 0:30 faster up and 1:00 faster down, but either way, I get more absolute pace increase for the same increased effort going down than up. Let's say a 10 mile race has 5 miles of uphills and 5 miles of downhills spread throughout. If I have extra effort to give, where is that effort best given to get me to the finish line the fastest? Answer: the downhills. I'd rather put that extra effort in to go 1:00-1:15 faster for 5 miles of down than 0:20-0:30 faster for 5 miles of up. You can convince yourself of this if you want to spend a bit of time on a treadmill that has up and down slopes. 3% +/- is fine. Get your HR monitor on, figure out your steady state pace at your easy/talking HR on flats, 3% incline, and 3% decline. Now figure out your steady state pace at easy HR +15 for flat, +3%, -3%. Do this several times over several days as jacking your HR up 15 points will effect every consecutive effort; but I think you'll be surprised how much the pace spread changes going down vs. going up. If you can find a treadmill that can do +/- 6%, the difference will be even greater. Now my second point which I should have separated out originally, which frankly is independent of hills: keeping an even HR is preferable to jacking it way up. One interesting experiment to do if you use a HR monitor is do a series of medium length runs on a treadmill; like 2 hours. On a few of them, you keep your HR flat and easy (for me about 140) and watch how pace changes over time. One surprising thing I found is that my fastest pace at that easy HR doesn't happen until I've been running AT LEAST 30 min, and sometimes I'll stay around that fastest pace well into the 1:30 range. Anyway, you build up a good knowledge of how your pace at an easy HR goes over time. Now, for the second set of experiments, keeping the treadmill level like before, after warming up for say 30 min, do a 2-5 min hard effort and get your HR up. For me, hitting something like 165+ for at least a minute. Then slow down again to stabilize your HR back to your easy HR (again, that's like 140 for me). Given that, for the rest of the run (another hour+), I will NEVER be as fast at 140HR as if I hadn't jacked up my HR, even if only for a minute or two. It's like once you jack your HR, you never really fully recover your speed potential at an easy pace. And if I do another hard effort interval, then I'm even slower at my easy HR. Each spike in effort takes a toll from which I can't seem to recover, even though I've returned to easy effort. Note that the spike has to be a real spike, not jumping up like 5 bpm. Put another way, what's the fastest way to run a flat road marathon: sprinting every third mile and the slowing to recover, or running a steady pace (Galloway walk/run strategy notwithstanding!)? Answer: steady (or slowly increasing) pace, but I'm going to argue that it's not really steady pace, but steady EFFORT that gets you through the fastest. Now what if that road marathon has hills? Should you be killing it on the uphills, or keeping it at a steady EFFORT? I'd argue to treat the hills just like you'd treat the flats: steady effort, not steady pace. Which would translate to going slowest uphill, fastest downhill, and medium on the flats, but with the effort moderated. Combining arguments 1 &2, when you approach the last few miles and have extra effort to give… you're best to expend that extra effort on the downhills, not the uphills. I'm certainly open to opposing arguments and views, but years of treadmill/HR work has convinced me that if you want to get to the finish line the fastest and have extra effort to give, you get more bang for you buck on the downhills than the flats, and the flats than the uphills. Everything you write makes sense if your underlying data about the uphill/downhill/flat running is correct. You seemed to have done extensive research on yourself, so would you mind sharing the data ? What pace can you run at 140bpm and 155bpm, when the grade is -6/-3/0/3/6 percent ? I hate to be skeptical, but I've never heard a pro say that their plan was to rest up on the steeps and push the downhills. Can I also ask how much you weight ? It's natural for heavier runners to be relatively better on downhills than uphills. All the Strava segments seem to support that for me. I think what he is trying to emphasize is that, should your muscles be adequately trained for downhill running, you can move much faster at the same cardiovascular effort. Gravity is a beautiful thing. Evan, that's not his point, or if it is then I'm really misunderstanding, which possibly explains why somebody keeps giving me the thumbs down. Dan claims that there's more to gain from pushing hard on a downhill than on an uphill. Dan, regarding steady effort yielding the best time in a race: does that mean that the first and last mile in a marathon should feel equally hard ? That said, part of my argument IS that for the same effort as measured by HR (which is an imperfect, but good first order approximation of overall taxing of the body) you get more bang for the buck downhill than uphill, thus that's where you should expend your extra effort if you want to do so. Second question: best time for a race… I was making some general statements when I used a marathon as an example… I am in _no way_ qualified to state what the fastest way to run a given marathon is, although I am pretty darn sure that a) the worlds' fastest marathons on flats have either been even splits or negative splits and b) given that, this implies that your 'effort' is actually steadily increasing throughout the race. A fascinating physiological discussion unto itself, to be sure, and I believe also formed part of the supporting basis for Noake's central governor theory. I digress. Files: my year long treadmill/flats experimentation was several years ago, so that HR data is not annotated for incline/decline, but you're more than welcome to have full access to all my past 5 years of Garmin Connect data! Just email me at kzemach (at) runbox (dot) com as this discussion probably needs to proceed outside of this forum. Plus, then we can talk on the phone and argue it through. Who knows, maybe I'm smoking crack, but I'm pretty confident that when I expend extra effort on the downhills, I'm multiplying my payoff. I definitely did not mean to imply that you were giving me the thumbs down. I assume that you wouldn't take the effort of answering in such detail (which is greatly appreciated) if you thought that I was an annoying jerk. I only brought it up because this is my first discussion here and I was puzzled by the negative feedback. Yeah, the thumbs down thing is likely more due to people just weighing in on whether or not they thought you were correct in the statement, not a reflection of you. Trust me on this: this site is extremely welcoming. Don't be shy. However, bold statements are asking for rebuttal, which is why I am enjoying this back and forth due to mine. *Figure out your easy/cruising/long duration HR. I'll use mine for argument sake of 140. Let's pick a harder effort HR at 165, a whole 25 higher. *Run a few times up at 140. Figure out an approx average time. Do the same for the down. Now do the same for the up (and then down) at 165. Make sure you're rested before each up/down and then shoot off to get to that steady state HR by the end, to account for Ian's point about lag and make that lag time equiv. *Now see where you saved the most absolute time allowing HR to go from 140 to 165: up, or down? I honestly have no idea what the answer will be, but I will say for me, on a slope more like 4-6%, it's on the down FOR SURE by a looooong shot. I will note that I would REALLY REALLY like Ian Torrence, the author of this nice article, to weigh in on the following statement that I'll make. STATEMENT: The effect of gravity is such that extra 'effort' put into a hilly run when trying to achieve the fastest finish time is better spent on the downhills than the uphills. This statement is based on using HR as the metric of 'effort,' and that the same increase in HR results in a larger absolute increase in pace downhill than uphill, resulting in a faster overall finish time. Assumptions: non-technical trails (heck, call it a road), and granted that uphill and downhill recruit different sets of muscles but we're assuming that all are well trained so that you don't have to 'save' your quads on the downhills. Ian, what says you? Feel free to throw me under the bus; I am really interested in your thoughts on this. jomagam's valid point that the "pros" often seem to hammer the uphills vs. the flats would appear to contradict my postulation…. 1) If you wish to be competitive you'll have to hammer all terrain types: the uphill, downhill & flats. That's it! However, if your quads go…you'll be unable to accomplish any of this. 2) In relation to non-technical, non-mountainous road/track events (marathon, 50K, 100K, 100M) the successful strategy is to maintain even splits/pace throughout. In order to achieve this, your effort in the final miles of said event will be MUCH greater than in the earlier miles. "Banking time" early in any distance event is a dreadful strategy regardless of terrain. 3) For the average ultrarunner the final quarter of the mountainous 100-mile event comes down to survival. Uphill efforts (that seemed easy early) become tremendous challenges. However, if the legs are tempered properly in training (and your nutrition strategy is good) your war against the clock or your nearest competitor comes down to your ability to use the downhill and flats to your advantage. If you don't prepare for the downhills in training you'll be at a disadvantage at this point in the race. 4) When using HR, if you are doing a hill workout or racing a hilly course and run hard uphill and immediately run downhill expect the heart rate to lag 15-30 seconds and then take another 2-3 minutes to stabilize to the new exertion level. 5) I'm an advocate of training and racing trail ultras by effort, not by HR or pace. Thanks! I would slight (respectfully) counter #5 in that HR is likely the best accessible _objective_ measure of effort. Yeah, there's a lot more to effort than what your HR spits out, but I find for me at least, that just going by feel doesn't give me the best results. The obvious flaw in my statement is that since I do almost every run for years with a HR monitor, how the heck would I have ever developed my own feel? Over-applicability of technology in action…. If you're "perpendicular to your running surface" on a steep hill, you will fall over. Fantastic article and thanks for all the links. I've been looking for this kind of information for the last few weeks. Thank you for sharing the section on exercises to strengthen. Downhills have been the downfall for me with bulging discs in my lower back (see: 2 days after Imogene!). I have been really focusing on strengthening lately to support as much of my body during the jarring downhills and this gave me a few more ideas. I will especially be thinking of foot placements being more under my torso although the rocky terrain will more than likely dictate that a bit more. What I have found works for me is to increase the footfalls. This really allows me to be lighter on my joints and given enough time, starts to pull a smile onto my face. It just seems kinda fun to bounce quickly from spot to spot between or on top of rocks. I drag a 4X4 tire up a 3km shingle track and then run down with that on a regular basis. The big one i try to do every few months is a steep 900m climb followed by a fast descent. I find it smashes me for a few days but provides a good base for some time, useful given family preclude the ability to run at will. Ah the deadly downhills. I never feared them till I ran my first marathon in Hyderabad(India). My quads got bummed after 15 km of up and downhill running. I never knew they can be so punishing. Anyways I run downhills more deliberately and focus on strengthening my quads, hammies and core. I love running downhill, and you have some great suggestions here. Most of it I was already doing intuitively, such as imagining legs landing behind me. I could see the strengthening paying off big time. My favorite leg hammering workout: find all the little knolls and embankments along side trails and launch off them. It's basically plyometrics, it trashes you, and it's fun as hell! I'm a big fan of workouts that don't feel like workouts.